Supernatural 6x14 "Mannequin 3: The Reckoning"
Um, I really don't remember the last time I have been so creeped out during a Supernatural episode. Seriously, what is it about dolls come to life that is so terrifying? Just that little eyeball moving of its own accord in the opening scene! Agh. AGH! Agh agh agh! I full on started whimpering, knowing it was coming. "Oh no, this is going to be creepy. aaahhhh... creepy!" may have left my mouth. Maybe. Let's see how many times I can use the word creepy, shall we? Maybe I'll mix it up and use disturbing, freaky, eerie weirdness factor. Creepstermaximus. Okay. Sorry. But also? This episode had totally weird pacing/structure. I'm not saying it was necessarily bad, but it felt funky to me. I suppose I have gotten used to things going a certain way. Mixin' it up, peeps. The episode started right where the last one left off - with Sam down for the count on the floor. He seemed to be completely unresponsive, setting Dean's worst nightmares in motion. Luckily, he was only out for a couple of minutes, though to him it felt more like a week. But Sam appears to still be intact. At least for now, anyway. Dean encourages him to let the past stay in the past, so of course what happens? His past comes back to bite him too! How apropos. But that's getting a little bit ahead. Because, see, their case this week? Super, wait for it, creepy. A janitor was killed in a science lab, and then a dude at a doll factory or some sort of factory also gets killed in the same way. That is, they get this mystery gash appearing on their foreheads, and some mannequins start following them around until boom - death. At first they don't see the connection between the two, especially since they happened in two different counties, but then they discover that they had actually all worked at the factory together, and during that time, a nice woman named Rose went missing. Okay well technically, Sam found out most of this all on his lonesome, because Dean has been getting numerous calls from Lisa this whole time. He finally picks it up and lo, it's Ben, telling Dean that there's something wrong with Lisa and he's got to come lickety split. Of course, Ben is actually lying, which I think we all already knew, except for Dean, because when Dean shows up at their house, it turns out that Lisa's just about ready to go on a third date with someone, so Ben was just trying to get Dean back in their lives. Aww. I mean, it was obvious, but also obviously what a kid in his position would do. 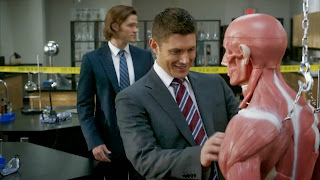 This forces Dean to confront the issue, and be reminded courtesy of Ben that he's being kind of a hypocrite. Because, you see, Dean is always spouting the importance of family, but fails to see that he had one with them. Dean being Dean, though, can't stay. Meanwhile, Sam has been figuring out the case on his own. He starts interviewing people at the factory where Rose and the other dudes worked, and comes upon a very suspicious one, and might I add, also creepy-looking, named Johnny. I mean, seriously. That facial hair. That stringy long hair and trucker cap. Who was he kidding? Sam, however, cottons on to it right quick, and just when it looks like poor/terrible Johnny is going to get it, Sam saves him. And then makes him confess what actually happened. See, he and his buddies decided to play a joke on Rose. The joke being that she had a secret admirer. They revealed themselves as such truly awful pranksters one night, and Rose accidentally got her head smashed. Dead. Rather than call the police, they buried her body in some random forest. Gah-ross. Clearly these were not the really great guys the various people claimed them to be after their deaths! Sam goes off to torch the bones, and tells Johnny he's free to go. Johnny heads back home to his triple disgusting real doll girlfriend, only she turns out to still be possessed by Rose, and Johnny gets his comeuppance after all. Ugh, that Johnny. One serious creepster. Knowing something is not quite finished with the case, Sam goes back to talk to Rose's sister Isabelle, to see if anything else of Rose's is still around that is tying her to her mortal coil. It turns out to be rather a surprise - Isabelle has one of Rose's kidneys inside her. Now that is an interesting predicament they haven't ever really discussed the possibility of before on this show. By this time, Dean has made it back to town, and they are trying to figure out just what to do. Before they can do that, though, pissed off vengeful spirit Rose possesses Dean's baby, the metallicar, and starts chasing him around the place. Dean is forced to make the Impala crash into a building, but a piece of the broken glass manages to fly into Isabelle's gut, killing her, and thereby Rose's spirit. Poor Isabelle. The boys have really had trouble saving people lately, haven't they? At the end of the episode, we have the return of the patented round-the-Impala brotherly chat! What! I feel like we haven't had one of those in a while, but I could be extremely wrong. Dean is feeling morose about everything that's gone on, and how they seem to have more bad luck than good and you know, the general emo crap he usually likes to hate on. Sam tries to bolster him up by thanking him for giving him back his soul, and saying he'll always have his back. But you know what Dean's thinking? Sometimes, it's not enough. - When Sam was getting ready to torch the body, I was thinking to myself - uh oh, that's a burning body in a hole. Remind us of something?? Apparently it was fine for him, since he's done it enough times. - The montage of Dean, Lisa and Ben was so sad. Now it really feels like it's the end of them. Sniff. - I'm not sure Ben won't eventually decide to follow in your footsteps anyway, Dean, no matter how much you tell him he shouldn't. - I sincerely hope I do not have dreams about dolls coming to life. Ick. Way to ruin one of my favorite childhood movies. Seriously, other Mannequin fans out there? - Oh. Man. Next week's episode! I hope it is as hilarious as it looks to be.